One of the surprising gift, that any kid will love to have, would be a pair roller skates. Not only kids but people of all ages like roller skating, as a fun sports and hobby. Needless to say, skating is a good aerobic exercise that burns fat and will improve flexibility. Two main types of skating shoes are inline skates and quad skates. Inline skates have 4,5 wheels aligned in a line, and is recommended for expert level skaters. Quad skates have 4 wheels, aligned in a parallel way, and is more balanced. Small and beginner skaters will find quad shoes more convenient. 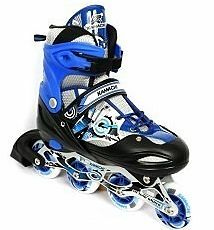 Many different variations of these 2 types are available in market like, kids skates that limits speeding up, Skating shoes specifically designed for outdoor skating, indoor(traditional) skating etc. Adjustable skating shoes and fixed skating shoes are also available. Fixed skating shoes would be more comfortable and tight. But the advantage of adjustable skating shoes is that it can be adjusted to foot size and can be used for long term(if it is of good quality). Shoes are available in different colours and designs including traditionally designed models and newly designed models. Skating shoes for kids are most demanded category in and you can find wide range of junior skating shoes. You can choose from shoes that are specially designed for kids below 10 & 5. Skating shoes with brakes (safety measures) are suggested for beginners because chances of risk is very high. Kids should use helmets and pair of knee pads. Beginners should look for shoes with heel brakes or toe stops for stopping and controlling while learning stage. Following is the list of best selling Roller Skating shoes available online in India (2016 update). Chosen based on brand value and quality. Roller skating shoes for kids-Below age of 5 to 10 comes in junior category. Not many good options are out there, but following one from Cosco. Colour – blue & black OR red and black combination. Indoor – yes, Outdoor – can be used outdoor. Adjustable – yes, Brakes – no. Price range – Below 700. Colour – Pink and light green combination. Adjustable – yes, Brakes – Yes. Price range – Below 2500. Check price at – amazon India, Flipkart. Colour – blue & black combination. Adjustable – yes, Brakes – yes. Price range – Below 5000. Colour – red and black combination. Adjustable – yes, Brakes – yes. Price range – Below 2000. Colour – black, silver combination. Check price at – amazon , Flipkart(not available). Brakes – yes. Price range – Below 5000. Brand – Cosco, Colour – red and black combination. Brakes – yes. Price range – Below 4000. Brand – Jonex, Colour – red and black combination, yellow wheels. Brakes – No. Price range – Below 2500. Check price at – amazon, flipkart.